Between 20% and 90% of all purchases are influenced by word of mouth: referrals and recommendations from one customer to another, either face-to-face or online. This means that a MAJOR portion of your total revenue is tied to the conversations among your customers. Yet, you probably don’t have a strategy for creating this chatter. You probably have a marketing strategy, a digital strategy, a content strategy, a social media strategy, a PR strategy, and more. But you don’t have a word of mouth strategy, even though it’s arguably the MOST IMPORTANT driver of your business success. Because nearly every company on earth takes word of mouth for granted. We just assume our customers will talk about us. But will they? And if so, what are they saying. We will help you. We’ll work together to create a word of mouth strategy that turns your customers into volunteer marketers. We’ll use our proprietary, six-step Talk Triggers process to develop a truly talkable differentiator that will bring you new customers, at low to no cost. After all, 83% of customers have made a word of mouth recommendation in the past 30 days. We use our decades of experience, proprietary audience insights, competitive analysis, 6As metrics system, and operations optimization framework to provide strategies and operations plans that take you to the next level. Our clients include The United Nations, Cabela’s, Oracle, Cisco, adidas, The Motley Fool, Allstate, Pella Windows and Doors, Hilton, The Grand Ole Opry and more.These organizations trust us because we provide sound recommendations in a straightforward, hype-free fashion. Bring together your in-house team to determine existing information about customers needs and wants. Survey three different groups of customers about what they expect at each inflection point of their buyers’ journey. Develop candidate differentiators and score them on a viability matrix we developed. Identify a potential Talk Trigger you can use to create consistent chatter among customers. Test that idea and measure it online and offline. Once proven to work, we then help you take your new differentiator full scale, with a plan for how to amplify and promote it. Word-of-mouth marketing strategic plans require specific customer (and sometimes employee) research, so expect 60-90 days to complete the entire process. There is simply no better system for strategically and methodically crafting reliable word of mouth generators available today. 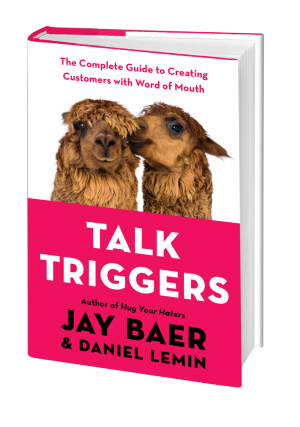 This is the same proven process documented in our new book, Talk Triggers: The Complete Guide to Creating Customers with Word of Mouth. We also offer onsite word of mouth development intensive workshops.These are focused, one or two day sessions that use many of the same processes and inputs as our full Talk Triggers strategic plan program (minus customer research, of course) and get you well on your way to creating reliable conversations. Because word of mouth is built using OPERATIONAL differentiators, not marketing tactics per se, it is required that stakeholders from marketing, sales, operations, and customer service are present together in our word-of-mouth marketing intensive. For more information on our word of mouth strategic planning or intensives, please contact us.